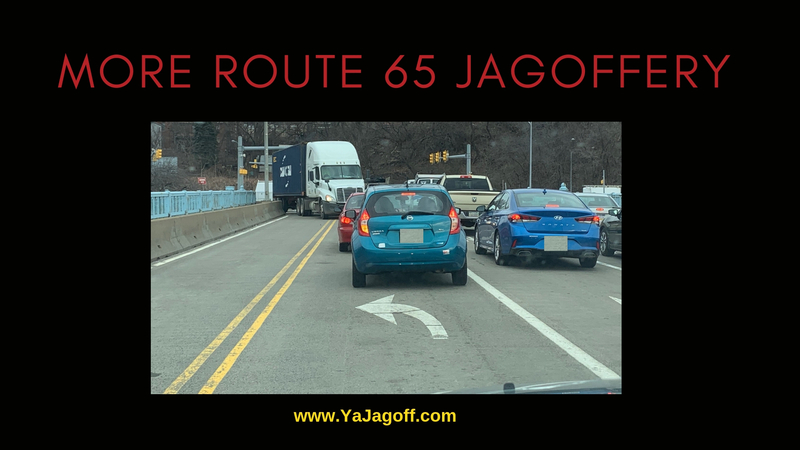 Once again.. because it happens every day… more jagoffery happening at morning rush hour. But it’s nobody’s fault other than the knuckleheads that re-designed this intersection. Today’s gripe.. some engineer sitting in an nice, swanky office suite thought it would be a great idea to narrow the lane… you know.. the one where tractor trailers…. who NORMALLY need to swing wide to make a turn… have to turn right from Route 65 on to the bridge but can’t because someone made the lane the width of a Spirit Airlines carry-on compartment! Results… the people in the opposite, left lane, have to back up and let the truck through. Not a biggie in non-rush hour cases. But, on most mornings, those left-lanes are in the left lane to be in the middle lane because the middle-laners are holding up traffic trying to cheat into the right lane! Confused? You should see it in real life! Paaaaleezzzzeee.. someone get a traffic engineer who actually drives out to this intersection to re-re-design this thing… Ya Jagoffs! Previous articleNew Video – Jaggin’ Around at Kennywood with Steeler Chris Hoke!